Greetings cherished programmers! It’s Andy Gesner and the staff from HIP Video Promo, hoping you had a terrific holiday season – and that you’re prepared for a rocking 2008. We’re kicking off the new year in grand style with a raucous new clip from one of the sturdiest names in hard rock: the irrepressible Sebastian Bach. The heavy metal renaissance-man has returned to the fray with Angel Down, his toughest, proudest, most uncompromising, and most infectious set of songs yet. And considering Sebastian Bach’s track record, that’s saying plenty. Real fans of heavy music will recall that although Skid Row shared bills and MTV airtime with the “hair metal” bands of the Eighties and early Nineties, they never fit into that category. When the rest of Bach’s peers were going unplugged, he was leading his band through stompers like “Monkey Business”, “Youth Gone Wild”, and the unforgettable “18 And Life”. Even “I Will Remember You”, the quintessential power ballad, rocked harder than most bands’ heaviest cuts. When Slave To The Grind became the first heavy metal album to debut at #1 on the Billboard charts, it was a victory not for the lite-metal movement, but for true headbangers. Skid Row’s thunder reached a towering crescendo on Subhuman Race, one of the most vicious and uncompromising records cut in the Nineties. Throughout, Bach and the group backed up the records with a live show unrivaled in mainstream metal for its intensity and raw energy. After the breakup of Skid Row, Sebastian Bach barely missed a stride. The entertainer proved his versatility in network reality programs, in Broadway’s Jekyll & Hyde and Rocky Horror, and in a recurring (and very funny) role as a spirited small-town rocker on Gilmore Girls. But the metal has always been his first love, and he’s never stopped leading ferocious bands: the group that performs on Angel Down is as fierce a combo as he’s ever fronted. Nor has his hard-rock pride waned – on the bruising “American Metalhead”, a set highlight, a defiant Bach issues his statement of purpose. “Brothers as one, ageless at heart”, he howls, “shoulder to shoulder, we’ll never die”. With his powerful shriek and menacing stance, Sebastian Bach probably shares more with Axl Rose than any other singer. In fact, Bach has long been close friends with the Guns ‘N’ Roses frontman, and he’s one of the few musicians who has been privy to the details of the making of Chinese Democracy. When the new G’n’R is finally released this spring, fans will be treated to an inspired guest performance by Bach. The ever-generous Rose has returned the favor by adding his world-famous pipes to three songs on Angel Down, including lead single “(Love Is) A Bitchslap”. It’s a rollicking cut typical of Sebastian Bach: a tale of a late-night cruise, a trip around town with nasty attitude in tow, looking for trouble. The vocalist co-directed the performance clip for the lead single, and it’s vibrant, too – concert footage of a wild and charismatic Bach in top form, dominating the stage, and keeping a packed house spellbound. The astonished looks on the faces of adoring audience members testify to Sebastian Bach’s enduring magnetism. He hasn’t lost a step: he’s better than he’s ever been. We are incredibly excited to have the opportunity to work with Jack Ponti and Greg Edgerton at Merovingian Music to bring you this fierce new clip. You know how much we cherish working with artists with New Jersey roots and we’re thrilled to add Sebastian Bach to that list. The folks at Merovingian have been kind enough to hook us up with plenty of copies of Angel Down and tons of super-sized Sebastian Bach posters for all of your on-air giveaway needs, so please don’t hesitate to be in touch if you’d like to get your hands on some copies. If you need more info, call Andy Gesner at 732-613-1779 or e-mail us atHIPVideo@aol.com. 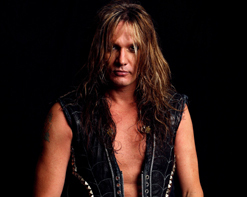 You can also visit www.MerovingianMusic.com, or www.SebastianBach.com to find out more about Sebastian Bach.